This is the Granddaddy of thermal protective gloves. The TSG-9000-SBDD is a 7-gauge heavy weight work horse. The outer layer is constructed with 100% virgin Twaron®, and the two inner layers are 100% cotton. The three-gloves-in-one provide protection from the most extreme environments. The gauntlet is aluminized and the perfect solution to protect the vulnerable wrist from molten splash and painful burns from thermal transfer. High heat silicone dots provide heat dissipation and excellent grip. With the addition of dots on both sides, expect back-of-the-hand concussion protection. They also transform this glove into a reversible piece of PPE , increasing the life glove and your investment. When we sent the TSG-9000-SBDD out to be heat tested, we received a surprising call; could we send more gloves? It turns out, when tested to the highest ASTM level 5, the glove would not register heat. Pardon? "It's true! ", they said. 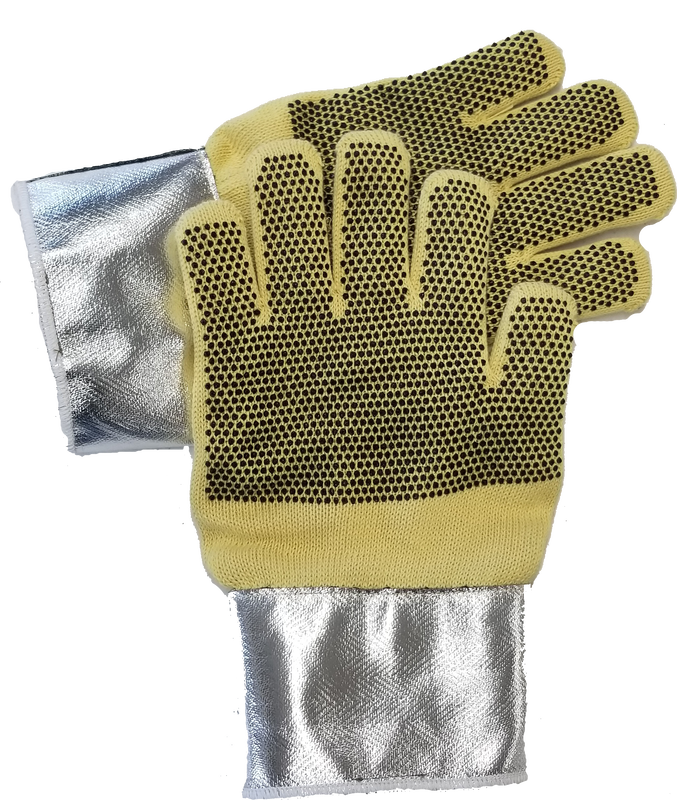 Tri-Star Glove introduces primary and secondary layer garments for molten metal splash protection. The secondary layer shirt and pants are constructed with fabric that will not support a flame. The fabric will not melt or drip. The shirts and pants are lightweight, comfortable, and inherently flame resistant. Primary layer aluminized garments include spats, chaps, aprons, jackets and lab coats. With design innovation and experience, we can work with you to create a solution for a solid PPE program. Tri-Star Glove offers safety value by delivering domestically produced, high quality, hand and body protection in a timely manner. In fact, we measure our lead times in days rather than weeks or months! ​Tri-Star Glove chooses virgin, non-recycled Aramid. Tri-Star Glove has partnered with valued suppliers that declare no recycled fibers are used in yarns and fabrics for our PPE. ​​​Tri-Star Glove proudly manufactures 100% of our products in Indiana. We identify threats, develop countermeasures, and deliver high quality knit gloves and protective apparel efficiently. Trust in us to do what we do best for you! When trusting in your PPE as a last defense to keep you safe on the job, can you be sure the very best went into manufacturing those products? From fiber, to yarn, to fabric, Tri-Star Glove takes pride in using the very best materials in our gloves, garments, and other products. While the world moves toward being a little more green and embracing recycled products, recycling Aramid fibers can actually diminish their performance! Recycling Aramid involves chopping and blending fibers. As a rule, the longer the fibers during the spinning process, the stronger they will be.